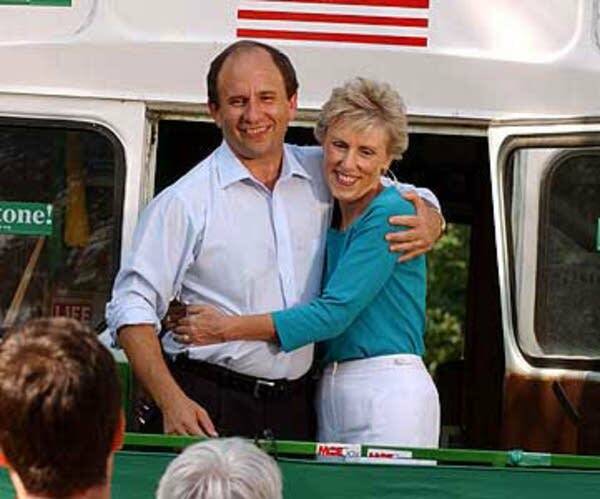 The event this afternoon to mark the 10th anniversary of Sen. Paul Wellstone's death will take place at the Wellstone memorial near the crash site near Eveleth, Minn. The memorial site will be busier today, but on a normal day, it's a quiet place in northern Minnesota. Daily Circuit producer Marc Sanchez went there on a quieter day and spoke to people who helped create that memorial. LeAnn Littlewolf wrote the poem that you'll see at the entrance to the memorial. She interned for Wellstone in 1993 and later Paul and Sheila Wellstone would pay visits to the youth organizing group Littlewolf started in Virginia, Minn. The poem belongs to the people, Littlewolf said, but it's also her way of saying thank you to the Wellstones and was a tool for her to remedy her grief. Littlewolf, an Anishinaabe from Leech Lake, drew from the symbolism of her culture, which uses the eagle to represent the spirit's journey home. When rescue workers approached the plane wreckage, they spotted eagles soaring above the crash site. She calls her poem "The Wellstone Poem:"
To guide their kind friends home. Pam Costain, a friend of the Wellstones, helped found Wellstone Action. If you've never been to the memorial near Eveleth, it's down a quiet road, a few miles off the highway. You come to a small dirt parking lot where you'll see Littlewolf's poem. Then you follow a path to a circle. There are six stone benches carved from Virginia slate - five monuments representing six people. I've been up to the memorial about five or six times, maybe. And I have been there in every season, so that's something that's been very important to me: to see it in summer, fall, winter, and spring. It is a very quiet place, because it's in such a remote part of Minnesota. You don't go there and very often find people there. And if I do happen to encounter other people, I tend to stay away, because I think a lot of people go there to be with their own thoughts and their own memories. In the fall it's beautiful, because you hear the leaves crunch underneath your feet. You hear the wind. The wind is very important to the feeling of the place. I think it's, I would have to say, a spiritual place, and you feel the wind coming through the area as well. There were stones chosen to represent each of the six people that are memorialized there, and those stones are anywhere from one to two billion, with a "b," years old. You really feel the enormity of time. One of the things that you do is you walk around a circle that includes the stone. And there's a front piece saying, "This is Paul and Sheila," or "This is Mary McEvoy." I stop at each stone, and I remember the person. And the stone itself, I have to say, speaks to me about that person and who they were. I don't know how this happened, because the people that chose these stones didn't know them. But they must have learned about them enough that they chose just the right stone to represent the person. For example, Mary McEvoy was very involved in early-childhood education... was really dedicated to young kids, and her stone is sort of lively and happy. Tom Lapick was a very, very quiet, unassuming personality. His stone is very unassuming and modest. And then, of course, Paul and Sheila's stone is together, which is completely appropriate, because they were one of the most united couples I've ever known in my life. They were really a part of each other. Every one of the six people memorialized there really made a difference. From the 25-year-old Will to Paul and Sheila, every one of them was living their lives with a lot of integrity. And so it helps me to remind myself of what's important by walking those footsteps and feeling their presence very profoundly. St. Paul sculptor Phil Rickey spent months trying to shape the stones just so. His process started by digging through discarded rocks at a nearby mine. I looked at a lot of stone, and then as I started to make editing on what I'd seen - what I'd photographed and thinking about it, and having had quite a few conversations with the family - I started to hone in on the appropriate stones to choose for the different markers. Combined with the searching in the mine and then the working process, the stones started to talk to me. I can't say exactly why each of the stones started to talk to me in the process. I was with them very intensely for almost 10 weeks. It was much longer than I anticipated that part of the process taking, because the stone was so difficult to carve. Part of that process, that difficulty, allowed me to get to know the material... constantly having this purpose. And through the time of making it, they took on a character. 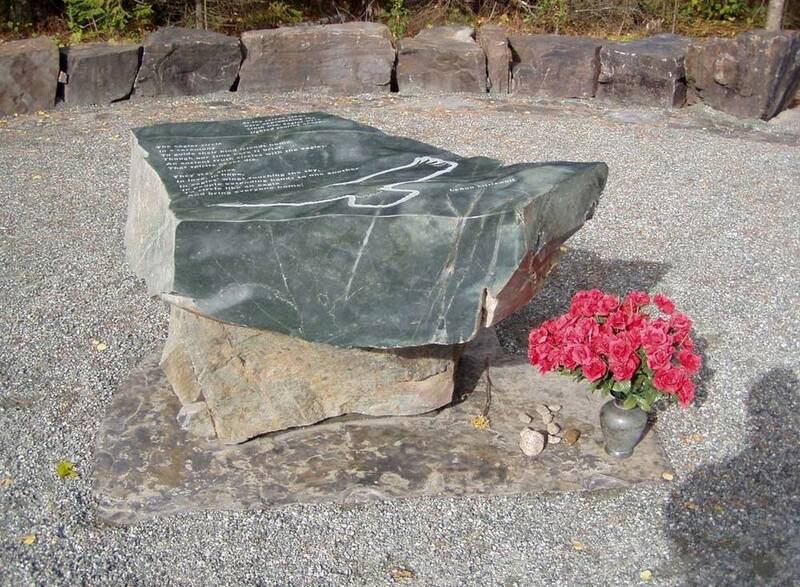 All of the stone that is in the memorial, except for the Ely Greenstone table that's in the gathering area when you arrive, or the arrival plaza - all the other stone came from the LTV mine in Hoyt Lakes, Minn. The Ely Greenstone is even older than the mining rock. The mining rock is over 2 billion years old, and the Ely Greenstone is two-and-a-half, or more, billion years old. It's a beautiful - when it's polished - sort of deep, soft kind of jade color. So it was a beautiful material to use as a sort of centerpiece with the poem about the eagles. Paul and Sheila's stone is overall black and red interspersed quite evenly, and then it has this jagged, white, quartz shape that comes across from the upper-right down across it. Before I went to look for the specific stones, I had in mind that Paul and Sheila's stone would be twice as tall - have a different dimension than it ultimately did. But that was the only piece of that kind of stromatolite at that scale that I found, and I very much wanted to have that be what you saw when you stood at the Eagle Table and looked to the northwest, because it would draw you up the path to go to the monument circle. I met Paul a couple of times. He was a man of small stature, but sort of powerful at the same time. Sheila, I think, was a bit taller, but had a different kind of power. And together they were a powerful couple. I was very pleased with how they came out.